Joel Leyden, a native of New York, has practiced international public relations, public affairs, crisis communications, journalism, social media and digital marketing for over 20 years. Joel Leyden, whose Zionism goes back to being a war volunteer in the Yom Kippur War, has served as a senior media consultant to the Israel Ministries of Foreign Affairs, Trade, Tourism and Defense and the US State Department. As an Internet and digital public relations pioneer, he co-created Israel’s first commercial Website – NetKing in 1995. In addition, Joel Leyden produced the first Website for an Israeli prime minister, established the first condolence Website for assassinated Israeli Prime Minister Yitzhak Rabin, co-created the Israel Defense Forces Website, was the first SEO – search engine optimizer in Israel and serves today as both commercial PR / SEO () and publisher of the Israel News Agency, Israel’s first on-line English news organization, Jewish News Agency and the United States News Agency. Leyden has worked as an international media consultant for the Israel Prime Minister’s Office, Ehud Olmert, the prime minister of Israel , Shimon Peres, the office of Benjamin Netanyahu, Israel Ministry for Foreign Affairs, the Israel Ministry of Trade and Industry, the Israel Ministry of Tourism and the Israel Defense Forces  where he was awarded a commendation for his crisis communications work during Operation Defensive Shield. When Israeli Astronaut Col. Ilan Ramon perished in the Space Shuttle Columbia disaster on February 1, 2003, Leyden prepared the first communications to the media from the IDF. Joel Leyden, a political centrist, has served in the IDF combat engineers, the IDF Spokespersons Office and today serves in the Israel Border Police (res.) – MAGAV. Leyden has also served several times as a humanitarian officer in the Israel Defense Forces and promoted the concept  of improving relations with the Palestinians at one of the very few points of contact between Israelis and Palestinians – Israeli security checkpoints. Joel Leyden also served as senior media advisor to the International Coalition for Missing Israeli Soldiers where he succeeded in having former PA / PLO leader Yasser Arafat admit that he knew where the IDF soldiers were and provided the dogtag of Zaharia Baumel to then Israel Prime Minister Yitzhak Rabin . and medical teams were performing in saving lives. 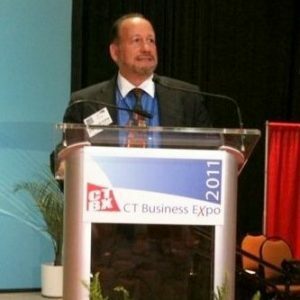 Joel Leyden, who is a professional cross-cultural consultant and served as director for Berlitz’s Middle-East cross cultural programs   , has created dozens of local and international community and professional social media forums  in Facebook, Twitter and Yahoo which today consists of thousands of members reaching over 5 million worldwide. During the IDF Operation Grapes of Wrath Leyden provided free Internet service to the hundreds of Israeli children who were confined to air raid shelters in northern Israel. 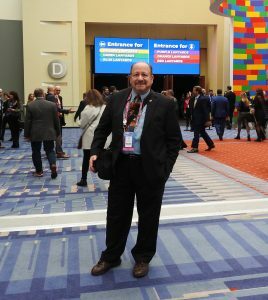 Covering AIPAC 2019 for the Israel News Agency. Joel Leyden, the father of three children, is a leading father’s and children’s rights activist in Israel advocating equal access and reforms in Israel’s gender bias family court custody laws and public child welfare departments for children of separated and divorced parents in Israel. In 2008, Joel created the Family First party and ran for mayor of the city of Ra’anana, Israel. He was not interested in securing the office, but as stated in the Haaretz newspaper, wanted to make father’s rights, children’s rights and the practicing of gender bias discrimination in Ra’anana’s Child Welfare department a campaign issue. In the States, Joel Leyden was a media advisor to former New York Mayor Ed Koch, former New York Governor Mario Cuomo, Senator Edward Kennedy and Senator Ted Cruz. Joel Leyden coordinated several national media events with personalities including former President Ronald Reagan, Nixon adviser Henry Kissinger and holocaust survivor Elie Weisel. Leyden served on the first board of directors of the Alzheimer’s Association in New York City. As a former ski racer and licensed ski instructor, Leyden has promoted the Israeli Mt. Hermon ski resort. Joel Leyden was also responsible for coordinating the first marathon run through the streets of Jerusalem. Joel Leyden has worked with HIAS, the United Jewish Appeal, the Israel Forum, the Israel Chamber of Commerce, the Association for Missing Israel Soldiers and the Israel Export Institute, served as a senior editor at the Jerusalem Post  and as a media adviser to the Israel Government Press Office. Joel Leyden covered the aftermath of the 9/11 terrorist attacks from New York City for the Jerusalem Post, Israel TV, Israel Radio English news and the Israel News Agency (). US President George W. Bush to Israel for her 60th birthday. Joel Leyden founded the IsraelPr Internet discussion group. This group brings together over 200 public relations and public affairs consultants world wide who are able to provide various Israeli governmental ministries with real-time advice. He is also credited for creating and operating several non-profit on-line community support groups on Facebook for Israel’s Anglo community such as NewRaanana, Israel Anglo Singles, Israel Children , Israel Anglo Homes and Doing Business In Israel. Leyden created the first global SEO political contest in response to the Holocaust cartoon contest sponsored by Iran’s best selling daily newspaper Hamshahri. There were over 40 million Internet page views indexed by Alexa for this non-profit, SEO contest Website that Leyden built and mass marketed. anti-semitism and all forms of racism off and online. Joel, a pioneer in Web 2.0, lectures on the development of Internet, digital marketing, digital diplomacy, crisis communications, reputation management, global security threats to Israel and the Jewish community in Israel and North America. Joel Leyden, who has university degrees in journalism, psychology and mass communications, resides in Ra’anana, a suburb north of Tel Aviv, Israel and New York. Leyden Communications Website – Joel Leyden’s Primary Website. Israel News Agency Website – Leyden created the INA in 1995, serves as publisher. The Jerusalem Post – Cover story detailing latest contributions Leyden has made for the Anglo community in Israel. The Jerusalem Post – Home page feature on Joel Leyden. Click here for articles you will receive when performing a search on Google for Joel Leyden. Play this song as you read the below feature. 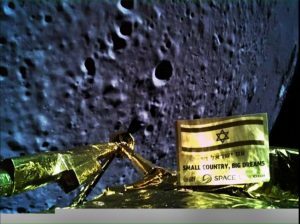 Jerusalem, Israel — April 11, 2019 … Was the SpaceIL Beresheet moon mission a success? On a scale of 1-10 – we would give it an 8. The purpose of this mission was to have a successful launch and reach the moon. Beresheet successfully reached and held an Earth orbit. Beresheet successfully entered and held a lunar orbit. Beresheet was on target as it made a hard landing. It reached the moon after traveling over 3.4 million miles in its orbits around the earth and another 1 million around the moon. Beresheet reached it’s target. Disappointing that the main engine and communications cut out on descent, and we will fix these and other bugs with Beresheet 2.0. Have no doubt about Israel’s space industry. Israel has produced some of the world’s finest, most sophisticated satellites – for both weather and defense purposes. All created by the government with an adequate budget. a selfie of herself – was a message for us all – keep dreaming, keep doing. The greatest success illustrated by Beresheet is the respected Israeli asset of making a dream come true. Having vision and not letting go of it. On a shoestring budget, we produced a spacecraft that reached the moon. Granted, not in one piece, but perhaps hundreds of which one day we can look back and hold one of those pieces, smile and say with pride – this is where our space journey started. I was in uniform at the IDF Spokesperson’s office when Israel’s first astronaut Ilan Ramon perished. It was truly a tragic day. Nothing can equate the loss of life. But this was different. Beresheet was a scientific experiment, a romantic dream that went mostly to plan, an experiment for which we will learn from and grow as we create Beresheet 2.0. In the IDF we have one word to describe today’s Beresheet mission. That word is Kadeema. To move forward with all that we have learned and prepare ourselves for the next mission. As Israelis, we do not fail. We may hit bumps, but we get right back up and move forward – with a Beresheet smile. And we say Kadeema! – Joel Leyden, Publisher, IsraelMoon.com. Jerusalem, Israel — April 6, 2019 … Beresheet (Hebrew for Genesis) – Israel’s first spacecraft to land on the moon, has entered lunar orbit and is on an “excellent” track, according to data from the SpaceIL and Israel Aerospace Industries (IAI) engineering teams at their control room in Yehud, Israel. Beresheet is scheduled to land on the moon at about 11 p.m. Israel time on April 11. A more definite time will be announced in the next few days. During the coming week, SpaceIL and IAI will conduct a series of intense maneuvers with the spacecraft in preparation for the landing. During the critical Lunar Capture maneuver, when the spacecraft entered the moon’s orbit from the Earth’s orbit, Beresheet provided dramatic pictures of the moon while activating its engines. Beresheet, built by SpaceIL, a nonprofit in Israel, is the first privately funded venture to send a spacecraft into orbit from Earth. SpaceIL was originally aiming to win a $20 million Google Lunar X Prize as the first private robotic craft to set down on the moon, but the deadline passed last year. SpaceIL pushed on even without the monetary incentive. “Our luck is still holding, and we’re going to make it,” said Morris Kahn, an Israeli telecommunications billionaire who provided financial backing to the mission. Beresheet is equipped with a high-resolution camera to capture panoramic views of the landing site to help scientists better understand the area. The Israeli spacecraft also carries a small “time capsule” loaded with photos and cultural artifacts, including a copy of the Bible engraved on a coin-size disk. If all is successful, SpaceIL will join just NASA, the former Soviet Union and China in successfully landing a spacecraft on the moon. Jerusalem, Israel — March 31 … Why is Ariel Gold banned from entering Israel? One can easily find the answer on Twitter or Facebook. Just look for someone yelling that Israel is a criminal, Apartheid state responsible for dozens of massacres, torturing sweet, Palestinian babies and creating dark sandstorms. Ariel Gold, national co-director of US extreme left-wing activist group Code Pink and an advocate of the Boycott Divestment Sanctions (BDS) movement, holds a Masters degree in Social Work. She knows how to professionally manipulate public opinion. Gold knows how to incite Palestinians to violence and terrorism. The official reason given by Israeli security is that she supports the BDS movement. Fact: BDS was designed to destroy Israel. They do not propose a two state solution. They do not propose a peace plan. Rather, they are known for chanting “From the river to the sea, Palestine will be free.” In other words, kill the Jews. Major Jewish organizations, including the ADL, condemn the BDS movement for an anti-Zionist position which masquerades for anti-semitism. Ariel Gold, claims to be Jewish. She even posts a photo of herself at her son’s Bar-Mitzvah. But not to far from that photo is another of Gold standing next to the Western Wall. No, Ariel Gold is not praying. 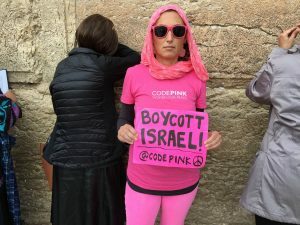 Gold and a fellow Code Pink member unfurled a boycott Israel banner at Judaism’s ancient, most holy site, to declare that the Western Wall and all of Jerusalem is occupied. Rules and laws don’t seem to apply to this Master’s of Social Work. In November 2015, Gold was arrested while participating in a Palestinian riot. In March 2015 and 2016, Gold was arrested for blocking the entrance to the American Israel Political Action Committee (AIPAC) annual conference. In June 2015 Gold was arrested again and charged with trespassing during a protest. In 2015, Gold coordinated a 5-week U.S. speaking tour for Palestinian propagandist and provocateur Bassem Tamimi, whose U.S. visa has since been revoked. The tour was organized by Jewish Voice for Peace, FOSNA, and IFPB. Bassem Tamimi has exploited young children as political props in staged confrontations with Israeli soldiers. In 2011, he was jailed for organizing violent rallies and inciting minors to commit violent crimes such as rock-throwing. Her blood libels know no limit, no borders. Gold does not respond. She throws rocks, talking points and soundbytes and disappears. The Israel News Agency asked her for comment. She refused. So what is it that attracts hundreds of Jews online – from the Israeli government to global citizens to subject themselves to her verbal abuse and lies? Ariel Gold is an attractive women. She has a soft smile. And she says she is Jewish. Using the fact that she was born Jewish and has a Jewish sounding name, she is the classic wolf wearing sheep’s clothing. So as family, many try to reason with her, debate her and even curse her. Most psychologists would suggest – ignore her. In fact, many believe that she suffers from narcissistic personality disorder. She talks, she lies, she posts dozens of photos and videos of herself but never listens and rarely responds. For us at the Israel News Agency, we witness hundreds of online attacks on Jews and the Jewish state. We know Israel is not perfect, but then again we do not practice Apartheid, we do not gun down innocent civilians attacking the Israel Gaza border security fence, we cherish life, we don’t use our children as human shields. What sets Ariel Gold and the Jewish Voice for Peace apart from Israel and the global Jewish community are the words: “Jewish”and “Peace”. Ariel Gold, Code Pink, BDS, Jewish Voice for Peace and IfNotNow extreme Left wing groups are neither Jewish nor advocate peace. They want Israel to remove all security barriers and allow Hamas, Islamic Jihad, ISIS and Hezbollah to fulfill their open declarations of removing the hearts of all the Jews and to create a Palestine for Muslims only. That is true Apartheid. These are the words of Jihad. Holy war against Jews and Christians. Gold recently attacked a person who responded to one of her many blood libels on Twitter. The person she targeted turned out to be a terror victim. She had been walking with a Christian friend in a forest in Israel when an Islamic terrorist repeatedly stabbed them both. Her Christian friend was thought to be Jewish and a fair target and bled to death in that forest. Kay Wilson, who survived being stabbed 13 times, had the following response for Ariel Gold. Neturei Karta, which advocates the death of all Jews in Israel. 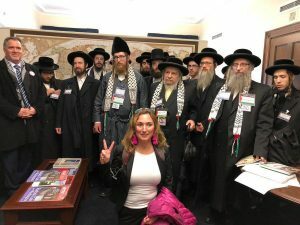 Ariel Gold who spits on the Western Wall, supports Iran and her terror proxies Hamas and Hezbollah, threatens the Jewish state with BDS and ignores Jewish victims of terrorism, needs to be blocked by us all. She is a Jihadist. There is no debating with her. Only the block button on Twitter and Facebook. As several, global news media channels practice not to mention the name of a terrorist to provide them with fame and glory, we must do the same here. As a matter of professional practice I always suggest to engage. Engage with respect in a polite manner. Attack the issues, not the person. When you come across Jihadists such as Gold, Jewish Voice for Peace and IfNotNow and there is no room for dialogue – move on. Do not give them the attention, the public relations they so badly beg for.